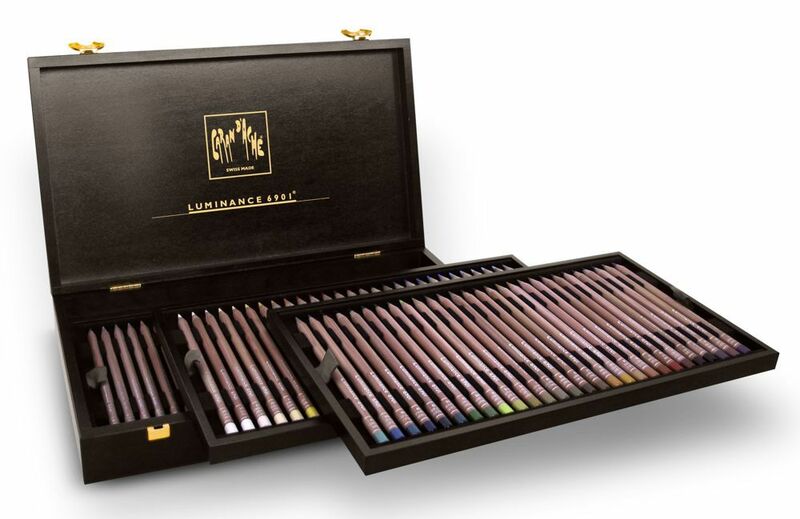 Luminance 6910 by Caran d'Ache are the most lightfast and permanent coloured pencils ever made. Each pencil consists of a 3.8mm diameter lead with an intense pigment concentration and a creamy texture, stored in an 8-ply round casing bearing the colour number, the colour of the lead and the name of the colour. 61 of the 76 colours in the Luminance range achieved the highest award (Lightfastness I) under the standard ASTM D-6901. Every shade has been formulated using finely-ground pigments chosen for their purity, intensity and resistance to UV light. The Luminance Wooden Box is beautifully crafted and contains 80 pencils, the full range of 76 pencils plus 4 repeat colours. There are 3 trays which fit neatly inside the box. The box dimensions are 38 x 22 x 6cm.